Whether or not it’s made of wood, your fence could with some tender loving care this holiday season. Winter is on the way, so what can you do to get ready for its arrival? How do you prepare for the winter holidays? Do you blare seasonal music, sing carols, or start hiding presents? In all of the fun, you might forget about your home’s fence. Whether or not it’s made of wood, your fence could with some tender loving care this holiday season. Winter is on the way, so what can you do to get ready for its arrival? 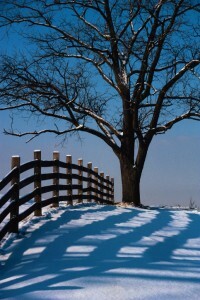 The first step to making sure your fence is ready for winter is to give it a quick inspection. How do the fence posts look? If you see any sign of sagging, you should do something about it. Don’t procrastinate when it comes to fence maintenance – you wouldn’t want your pet or your kids to get poked by a rusty nail that they didn’t see sticking out of your rundown fence, after all! Moisture protection, or waterproofing, is another critical part of making sure your fences are ready for the new season. Wooden fences need to be waterproof so they won’t rot, but if it’s been too long since the last time you applied a fresh coat of solution, you may want to get around to it. Stains, sealants, and paints all provide you with the options for proper protection. You might have a vinyl fence instead of a wooden one. If you do, then that’s perfectly fine. You’ll just have to care for it a bit differently. Clean off any mold, mildew, or algae you see growing on your vinyl fence. Also, take care not to get any snow or ice on it. The gates that are part of your fence will need some attention too. One vital part of the gates that help them open and close are the hinges. Make sure you find the time to grease the hinges and keep them moving – you don’t want to get stuck on the wrong side of your fence in a snowstorm just because the gates around your home won’t swing enough to let you through! Ready for Higher Quality Residential Fencing?